Darrin "Bobcat Tepes" Teply puts his shotgun to work at the North Springs Shooting Range. 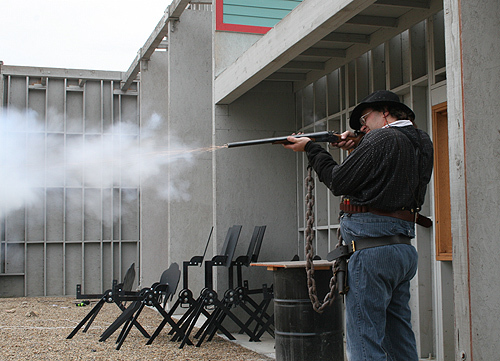 Shooting enthusiasts gather to take aim, share stories and live a little in the old west. Don "Stargazer" Burge prepares for his turn in a jail break scenario. The Balanced Rock Regulators met at the North Springs Shooting Range and Recreation Area on October 20 for their monthly shoot. 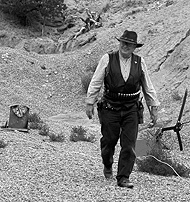 The Regulators are part of the Single Action Shooting Society (SASS) and during their shoots they come dressed in their favorite western garb and take on the persona of their favorite cowboy or cowgirl (real or imagined) as they shoot in a variety of different scenarios that test their skill. Price City's Don Burge, a member of the Balanced Rock Regulators said during the monthly shoot when it comes to weaving scenarios for the shoots the women put the men to shame, they show far more imagination than their male counterparts. During Saturday's shoot the Balanced Rock Regulators' vice president, Darrin Teply said that many of the Regulators didn't make it to the shoot this month because they were off hunting deer instead. During the shooting scenarios, the shooter's time and accuracy is monitored and the winning shooter is the one with the winning score. 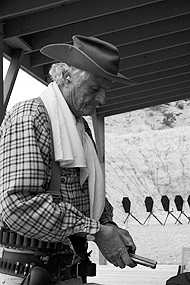 Ernie Bentley finishes setting up targets for the next shoot. During the morning shoot the Regulators took aim at a variety of different targets and in six different scenarios, one of which involved shooting rattle snakes that bore some resemblance to sections of garden hose. The object was to shoot the "rattle snake" across a line to count it as dead. Burge had some trouble with finishing off his target, but not as much trouble as he said he had in the past. In a previous competition, he had to shoot the biggest part of the "snake" across a line and the snake kept being blown into smaller and smaller pieces, none of them going across the line. "I took 40 shots at a snake. That's really crappy shooting," he said wryly. Three "Regulators" prepare for their next competition. The Balanced Rock Regulators meet the third Saturday of each month. Membership is $24 per year with $8 per month for the monthly shoots and $10 per month for non-Balanced Rock Regulator members. For more information, call 435-472-6666.